The migration of the pigments business to Asia, particularly China and India, continues. Since the mid-1990s, production in China and India has rapidly increased; China is now the world’s largest organic color pigment producer, especially for commodity-type pigments. Additional medium-tier to higher-value organic pigments may also migrate to China from North America, Europe, and Japan, as the large multinational producers no longer have patent protection over many of their products. Production in Europe, the United States, and Japan continues on a downward trend as the market has become globalized and gross margins have been squeezed, leading to plant shutdowns and restructuring. The volume of unfinished pigments imported to North America, Western Europe, and Japan for finishing continues to decrease as more finished pigment is imported from China. The worldwide pigments industry produces hundreds of colorant, extender, and functional pigments for a wide spectrum of industrial and consumer markets. The largest outlet for organic pigments is printing inks, followed by coatings and plastics. The fastest-growing sectors are expected to be coatings and plastics, especially in Asia. Global consumption of organic pigments is expected to increase at 2–3% per year from 2017 to 2022. Globally, printing inks account for about half of total demand on a volume basis, coatings for about one-fourth, and plastics and other industries such as textiles for the remainder. The printing market for publication of newsprint and periodicals has fallen as a result of competition from the internet, but demand for printing inks for packaging remains strong. The importance of aesthetics in packaging has grown as a result of the need for product differentiation arising from high competition in the food and beverage and consumer goods industries. The coatings market is primarily OEM coatings for automobiles. After bottoming out in 2009, global vehicle production started to rise again in 2010 and increased at a rate of about 4% annually during 2010–14 and 3% annually during 2014–17. Consumption of pigments in coatings has grown at similar rates. Other coatings markets include automotive refinishes, architectural coatings, and traffic paints. The plastics market is also expected to grow, especially as a result of greater demand in automotive applications. By pigment class, about half of the world volume share is azo pigments, followed by phthalocyanines (blue and green) with about one-third; high-performance and other pigments account for the remainder. The classic azo and phthalocyanine pigment groups are characterized by lower profit margins caused by rising competition from lower-priced imports, while the high-performance pigments group typically retains higher margins. China is the principal global supplier of red and yellow azo-based pigments and their intermediates. India is the principal global supplier of blue and green phthalocyanine-based pigments and their intermediates. Overall growth in the United States and Europe is expected to be less than 2% per year on average between 2017 and 2022, as the long-term trend in using inks for newspapers and publications continues downward as a result of competition from electronic media and devices. However, production of packaging and advertising leaflets and catalogs will provide some growth prospects for organic pigments for colored inks. Vehicle production in these regions is expected to remain flat, so use in automotive and other coatings is expected to show only average growth. In Japan, growth is expected to remain flat, while growth in China and India will be about 4–6% per year, because of increasing demand for inks and coatings. The major area of concern for the industry currently is stability of supply. The world is becoming more dependent on supplies of intermediates and finished products from China, and consumers have been experiencing disruptions in supplies of some products caused by Chinese government crackdowns on polluters. As a result, the prices of some pigments, especially those made from raw materials naphthol and arylamide, have risen substantially. 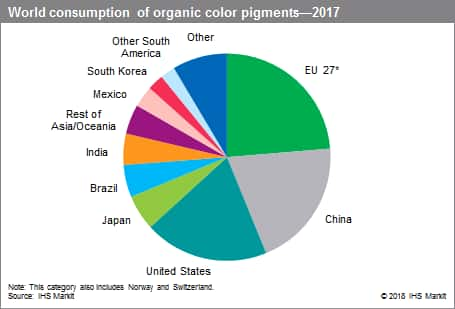 Most multinational suppliers of organic pigments announced substantial price increases in mid-2018. It is likely that supplies will be subject to more fluctuations in the future. The environmental practices of Indian producers will also likely come under more scrutiny from governmental authorities, which could result in closures of many small, noncomplying producers.